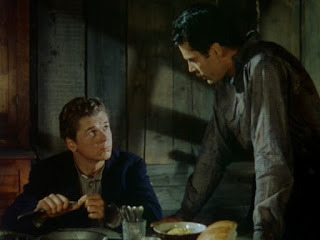 A colourful western with a nuanced revenge theme, The Return Of Frank James is a proficient adventure with a balanced mix of action and dilemmas for the central character to grapple with. With a huge reward on his head set by the railway company, notorious outlaw Jesse James is shot in the back and killed by the Ford brothers Bob (John Carradine) and Charlie (Charles Tannen). 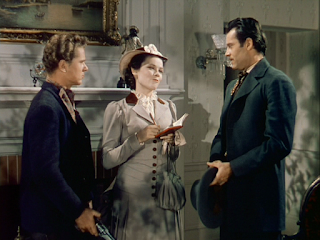 Upon hearing that the Fords were pardoned, Jesse's brother Frank (Henry Fonda) decides to emerge from his peaceful life as a farmer to seek justice for his brother. Along with his young sidekick Clem (Jackie Cooper) they go looking for the Fords, leaving loyal farmhand Pinky (Ernest Whitman) behind. Frank is intrinsically a peaceful man who eschews violence, and yet has to find a way to avenge his brother while himself avoiding the long arm of the law. He robs a railway company office to raise money for his quest, a heist that ends with him being wrongly accused of murder. He uses naive reporter Eleanor Stone (Gene Tierney) to spread false rumours of his death while continuing to track down the Fords. But then Pinky is arrested and Frank develops feelings for Eleanor, forcing him to his reassess his priorities. Directed by Fritz Lang and only loosely inspired by real events, The Return Of Frank James is an entertaining sequel to 1939's Jesse James. 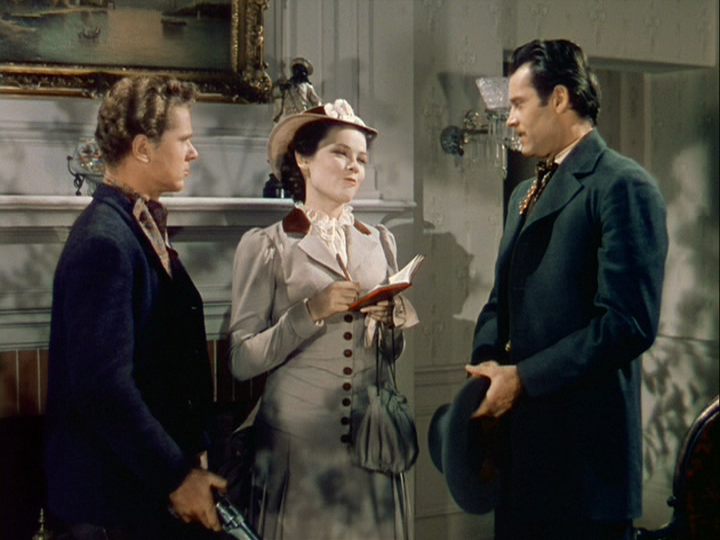 Filmed in rich colour and featuring Henry Fonda in fine form and Gene Tierney's screen debut, the film draws its energy from a conflicted central character seeking vengeance but also uncomfortable with violence. The Sam Hellman script perhaps tilts too far towards sanitizing Frank's character, but Fonda does the most with the role, building his screen persona as the morally upright man who nevertheless wants to ensure justice is served. The Return Of Frank James sets itself apart from many westerns by having Frank stop and pause at a couple of key junctures. He is initially content to let the justice system deal with the Fords, and only after they are pardoned does he struggle with the decision to abandon his quiet life as a farmer. Later Frank reaches another crossroads and has to decide whether to continue his pursuit or rescue Pinky from an undeserved fate and explore a potential relationship with Eleanor. Fonda excels at exploiting such predicaments, elevating the film from the routine towards the cerebral. Lang and Hellman do a good job of demonizing the Fords with subtle jabs, as the brothers aim to profit from their infamy by staging a cheesy play twisting their assassination of Jesse into fictional heroics. Further colour is added around the edges with Eleanor fighting to gain the respect of her father (a Denver newspaper owner). The film's final chapter includes plenty of attempts at humour as the action shifts to the court room (this part of the story very much inspired by real events), as Frank defends himself against accusations of robbery and murder. The Return Of Frank James is a pleasingly textured western, finding the gloss of human conflict in the legendary stories of outlaws and villains.